It wasn’t long ago my Mom asked me “what did you learn at work today?” I thought she’d confused me with my daughter and was asking what her granddaughter had learned at school that day. No, my Mom was directing the question at me, what did I learn at work today? I’m a bit embarrassed to share that I didn’t have a ready response for her. How is it that parents always ask the tough questions? I’ve been pondering Mom’s question and my uncomfortable lack of a response. Upon reflection, I found Mom’s question about what I’d learned at work to be especially relevant. We all know that—given our gig, knowledge, and shared economy—the way we work is changing, requiring continual learning at work. Further, more and more higher education outcomes are being measured in terms of students securing work in their desired field. And finally, higher education institutions’ promote lifelong learning as one of their benefits. 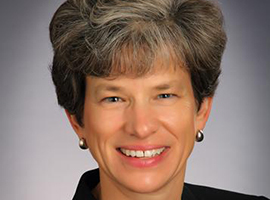 This is mostly in terms of one’s ability to be a lifelong learner after graduation, but some are now providing alumni with access to classes on the newest analysis technique or other hot topics, under the umbrella of being a student for life. We even hear about the benefits of daily learning and brain exercise from neuroscientists and the medical profession (have you completed your Sudoku today?). With all that change in the work place and emphasis on lifelong learning, the question “what did I learn at work today?” should have an easy answer, right? I, like others who are well along in our professional journeys, have experienced the benefits of intentional professional development. I’ve experienced the creativity that comes from stepping away from the day-to-day activities and fast pace in order to learn something new. I know the joy of being able to look at an issue from a different perspective and to learn from others. For me, these are great learning days! Kudos to all leaders and managers who intentionally provide learning opportunities for employees. In today’s competitive enrollment and advancement environment, investments in employees’ skills serve to both improve immediate institutional results, but also can contribute to employee retention and long-term institutional success. But what about every other day when I’m at work? I’ve concluded that if I’m intentional about it, I do learn something at work most every day. Today I learned about the correlation of course relevance to work and to day-to-day life to adult consumer perceptions of value and quality (see here). I need to practice what I tell my kids—be curious and ask questions from new perspectives, read, take advantage of readily available resources and colleagues, share new ideas and skills with others (my Mom included), and take time to reflect on what you’ve seen. How about you? How would you respond if your Mom asked you what you learned at work today? I challenge you to look for ways to learn something new from the data we use regularly, and to ask different questions to learn something new from your students and colleagues. In the spirit of sharing readily available resources, I hope you’ll take advantage of the many free resources and events Ruffalo Noel Levitz provides for higher education professional development, as well as the workshops and events that require a fee to cover the costs of convening. You’ll find timely articles and research on all enrollment management, student retention, and fundraising topics available at the Ruffalo Noel Levitz website. Consider gathering a small group and listen in to one of our free webinars, which regularly feature campus partners, so you know that what you’re hearing will work in practice. Importantly, I hope your group will stick together to discuss what you heard and the possible applications to your goals and challenges (I’m sure the promise of free food works as well with your colleagues as it does with students). You can find the latest on our events page. If you don’t already, consider rotating your conference schedule. Our workshops and conferences all receive the highest marks from colleagues for the value and relevance of the substance. Our National Conference will convene in July in Orlando with more than 150 sessions. Finally, to propel your career, focus your learning to earn a Certificate in Enrollment Management or a Masters, or a Ph.D. 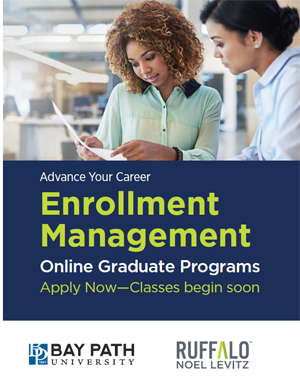 Explore the Ruffalo Noel Levitz certificate in Enrollment Management and complete the program in as quickly as 12 months. So when I see Mom tonight I’m going to tell her how her question prompted me to intentionally reflect on my daily learning and to encourage all of you to do so as well! Thanks, Mom!